The Crusader kingdom in the Holy Land began to collapse in the later part of the thirteenth-century. 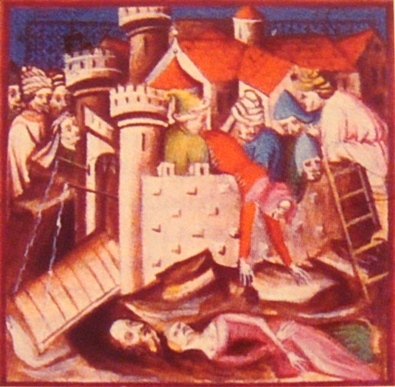 The fall (1268) of Jaffa and Antioch to the Muslims caused Louis IX to undertake the Eighth Crusade, Eighth Crusade, 1270, which was cut short by his death in Tunisia. The Ninth Crusade, Ninth Crusade, 1271–72, was led by Prince Edward (later Edward I of England). He landed at Acre but retired after concluding a truce. In 1289 Tripoli fell to the Muslims, leaving Acre as the only major Christian post remaining. …Also, it is said that a good 7000 people fled to the house of the Templars [in Acre]. Because it was located in a strong part of the city, overlooking the sea shore, and was surrounded by good walls, they defended it for perhaps twelve days after the capture of the city [by the Muslims]. But when the Templars and the others who had fled there realised that they had no supplies and no hope of being supplied by human help, they made a virtue of necessity. With devoted prayer, and after confession, they committed their souls to Jesus Christ, rushed out strenuously on the Saracens and strongly threw down many of their adversaries. But at last they were all killed by the Saracens. These two texts were translated by Helen J. Nicholson. We thank Professor Nicholson for her permission to republish these texts. This entry was posted in Primary Sources and tagged 13C, Crusades, Mamluk, Near East, siege. Bookmark the permalink.